Offline - An Offline Browser is a free application for Google Android devices that you can use to download web pages to your device to read them at any time even when you don't have an Internet connection at all or one that is unreliable. This can be quite useful at times. Reading the latest articles of your favorite online newspaper in the subway, having tourist information at hand right away while you are on vacation, or troubleshooting articles from your favorite tech blog that you can use for work. Offline is an easy to use application that requires only one extra permission, and that is to photos, media and files. Since it has to save the websites somewhere, it is understandable that it requests the permission. You add new web pages with a tap on the plus icon in the main interface. This opens a configuration page where you add the url of the root page and select the link depth and maximum number of links per page to follow. Link depth refers to the links that the app will follow. The default setting follows only links posted on the root level (the page you selected). You can increase that and the maximum number of links to follow to -- at least in theory -- grab all pages of a site using the app. The app processes one item at a time and queues all other. It is highly recommended to be on WiFi when pages are downloaded to your device as it requires quite the data especially if you don't uncheck the keep images option that it provides. You can read the saved pages at any time with a tap on the job in the program interface. This opens the selected root page by default which you can browse as usual. Depending on depth and maximum number of links, you may tap on links in the interface to read them without Internet connection as well. If you have Internet connection it gets loaded. If you don't, you get the notification that it is not available offline. It would be better in my opinion if the app would highlight offline pages in the built-in browser so that you know right away which are available offline. Scripts are not downloaded by the application during the process. The offline pages display no ads, social media widgets or videos for the matter. While that is appreciated most of the time, it means at times that you cannot use some functionality. It may for instance not be possible to switch between the mobile and desktop version of a site or click away cookie notices. As far as media is concerned, only images are downloaded while videos or other contents are not. Offline is compatible with all Android devices running 4.0 or newer. Offline is a new application for Android that is quite functional already. It could use a couple of extra features like the aforementioned option to highlight offline links in the browser, a scheduler to download new pages automatically or an option to browse the locally stored pages and remove those that are of no interest to you and keep others available permanently. All in all though this is a great application that can be quite useful in situations where you want to ensure that you can access certain pages on the Internet regardless of Internet connection. Meanwhile, “offline reading” is available in Chrome on Android: a website can use the ServiceWorker API to cache content and display it from that cache if user is offline. I struggled with the need for this type of service/app. Yes, it would have been awesome a long time ago when internet service wasn’t readily available. But now, not so much. Even the cases you mentioned: All my news site have an RSS feed that can be cached and used offline (i.e. 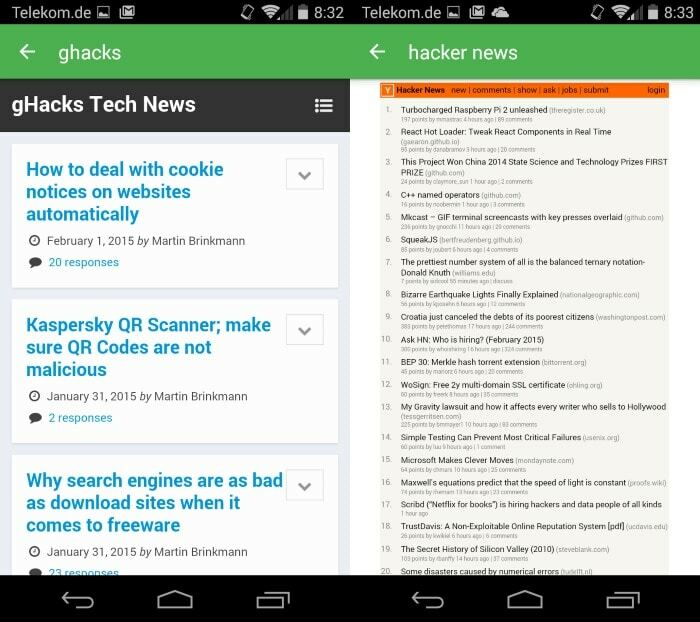 Greader Pro on Android and Newisfy on iOS) and any articles that you checked out can be sent to Pocket or Instapaper for offline storage. Map applications like Maps.Me and Nokia Here have offline capabilities with tourist attractions and restaurants built-in also. The internet is no longer like when it first started where I would navigate to AOL or Yahoo and click through links. Nowadays, I am being sent tweets and articles “curated” for me (that can be offline). I am still looking for a possible use case for this that can turn this mainstream. Any ideas? Lets say that you have way more options nowadays than ten years ago. Offline is just another option. Sure, if you are using different tools for that then it loses some or maybe even all of its usefulness but for someone who does not read RSS on mobile, who does not use Pocket or comparable apps, it can be quite useful. to see which apps youve got on your smartphone? Let me think about it. I don’t really run that many on it all the time! Seem to be an interesting and useful android app, great opportunity for who don’t have mobile internet. Aaand installed. This coming from someone who was trying to read books on my phone on Opera while offline. Stupid Opera tries to reload the tab when offline instead of just displaying the page as it had been loaded a couple hours earlier.